One of the best kept secrets of Indonesia, this little known diving destination offers premier muck sites. 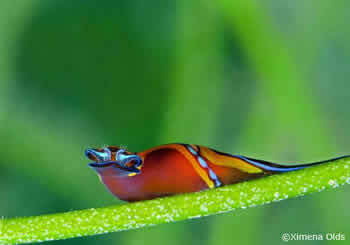 Ambon diving sites compete for the top position for “best critters in Indonesia”. Diving there offers healthy reefs, abundant marine life and numerous caves and arches. Because it’s wise to miss the monsoon season, the best time to dive Ambon is in October/November and April/May. A few Liveaboards from Komodo and Raja Ampat also include a couple of days diving in Ambon Bay and the Banda Sea. It’s easy to plan Ambon into your next trip to Indonesia because there are daily direct flights from Jakarta with Garuda and Lion Air. Plus there are daily flights from Bali via Makassar. Planning a dive trip to Ambon? We often feature discounts and also bonus offers on dive packages in Ambon in our monthly Beyond Bali eNews. Subscribe to our eNews to be notified when new offers become available. You may also subscribe to our Bali-Only newsletter if you are interested to dive in Bali. Contact AquaMarine for a dive package including air travel, liveaboard, or Ambon resort.